FLIP IT! can be used in the classroom, on the playground, in the grocery store, in the car, at home…anywhere! See below for a variety of resources to learn about and use FLIP IT! Winner of the 2012 National Parenting Publications (NAPPA) Award! Four supportive steps to help young children learn about their feelings, gain self-control and reduce challenging behavior. 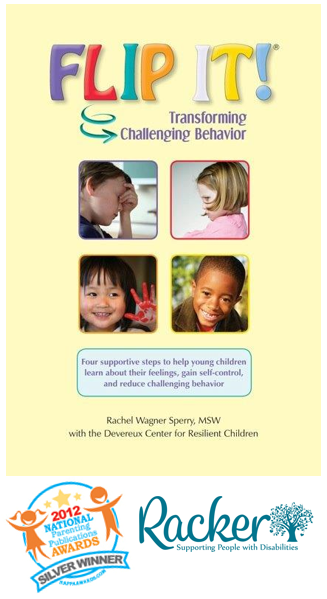 This informative book by Rachel Wagner, MSW with the Devereux Center for Resilient Children, is designed to support all adults who interact with young children. 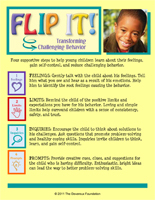 This guide explains FLIP IT!‘s four simple steps to transform challenging behavior in young children. 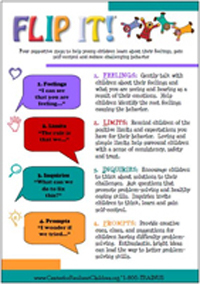 Teachers and parents can help children learn about their feelings and gain self-control by using the mnemonic: Feelings, Limits, Inquiries, Prompts. Learn to FLIP IT! with the practice pictures, reflection activities and real life stories inside. For volume pricing (purchase of 10+ copies), please see this page for coupon codes. If you need a formal quote before purchasing, please contact Caroll Berridge at [email protected] or call (866) 872-4687. The original FLIP IT! training curriculum was developed with the support of a one-year innovative grant from the New York State Office of Children and Family Services received by the Franziska Racker Centers (FRC). 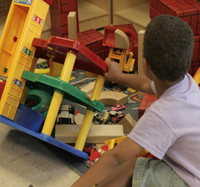 FRC is a not-for-profit organization dedicated to creating opportunities for people with special needs in Ithaca, NY. 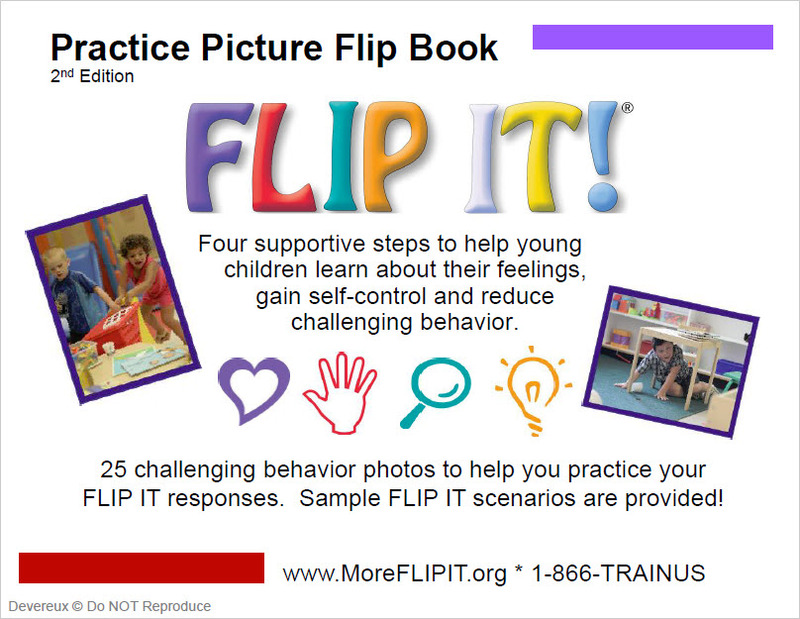 FLIP IT reminder resources provide visual cues that help FLIP IT users practice the four steps of FLIP IT. 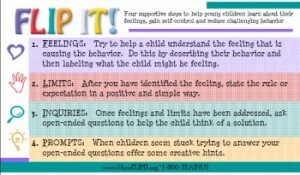 The FLIP IT Poster highlights the four steps: F — Feelings, L — Limits, I — Inquiries, P — Prompts. It includes the definition for each step and sample lead-in phrases to provide a visual reminder of the FLIP IT steps for use in the classroom or home setting. The poster is in full color, 14″×20″ in size. 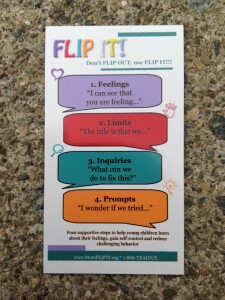 The FLIP IT Pocket Card also highlights the four steps of FLIP IT! The card easily fits in a pocket or badge holder, providing a convenient reminder for teachers and parents in any location! Cards are in full color, in two sizes, either 3.5″ x 2″ or 3″ x 5″. The FLIP IT magnet provides a reminder lead-in phrase for the four FLIP IT steps. The magnet is great for refrigerators and file cabinets, providing a convenient reminder for teachers and parents! 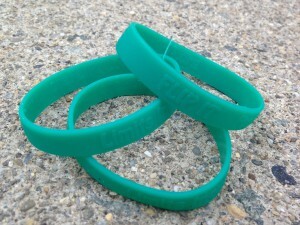 Magnets are in full color, 3.5 x 2. 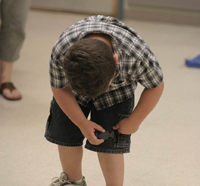 These 25 challenging behavior photos help you practice your FLIP IT! responses. Sample FLIPS provided! Review and practice with the photos regularly to increase your speed and ensure that FLIP IT! becomes second nature. Practice Picture FLIP Book is in full color. When FLIP IT! was being developed, an extensive literature review was conducted to inform the final approach. The literature review will provide confidence in the foundation of FLIP IT! and provide answers to questions that users may have about the strategy and how it fits within the larger context of managing children’s challenging behavior. Click here to view the literature review. 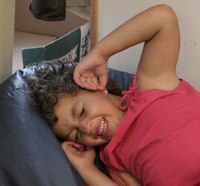 The following photos show pictures of children engaging in a variety of challenging behaviors. Use these photos to see and practice how to FLIP the child’s behavior. Remember, there are many possible ways to FLIP each scenario based on your interpretation of the photo. The sample responses are only one of several appropriate ways to respond to the situation. Check back often, as additional practice FLIPs will be added periodically!